1st edn 1967. Redesign 1972. 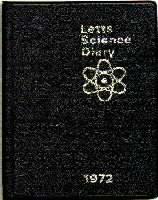 This year we are all pleased to be able to present Science Diary in a new format. When this handbook first came out, in 1967, it was felt that it would supply information in a form that would be helpful to people involved in science - and that includes scholars, students and specialist writers as well as academics and technologists. The response has confirmed that view. Science Diary has been continually revised and up-dated in an effort to keep abreast of current developments. But times change. And so, in order to bring the design up to date and to take into account the maximum of feedback information from our readers, this new edition has been redrafted from cover to cover. The bulk of the 128 pages containing as much as the average textbook - has been completely rewritten and now comprises entirely new information. The whole of it, even the mathematical tables, has been restyled and set in a more aesthetic type-face. Even the cover has been redesigned! To help with the new edition, several section editors have been invited to advise on the redrafting of the material in their own specialities. The biology section contains contributions by Dr John Slade. whose degree was concerned with plant physiology and who later carried out human genetics research at Cardiff. He is now a research microbiologist with a special interest in water-borne diseases. In particular his article on poisonous plants will have a general interest. Cases of poisoning are regularly reported in the press and in medical journals, and a systematic survey of some of the scientific aspects of this subject is a helpful extension of the kind of information we have published in the east. The chemistry section has been edited by Mr Howard Leigh, a schoolmaster in Kent. He was an Open Scholar at Christ Church, Oxford, where he gained his MA and diploma in education. He has had active research interests before turning to teaching. The new chemistry section follows recent changes in emphasis of the school syllabus and university research: it now devotes more space to physical chemistry rather than our earlier tendency to concentrate on inorganic chemistry and analysis. Much recent thinking on the nature of chemical materials has been incorporated in the section. Physics, now revised by Dr James Shaw, contains a considerable amount of new information derived from the nuclear field. The contributor graduated with honours from the University of Sheffield in 1967 and carried out particle research at the Daresbury Nuclear Accelerator (where he edited the photomultiplier section of the Daresbury Handbook) before moving to Cambridge. The section contains an article on some practical applications of holography, prepared for the Ministry of Technology by Ron Brown. The astronomy articles have been edited by Mr E. A. Beet, who was formerly senior science master at the Nautical College, Pangbourne. He is a fellow of the Royal Astronomical Society, a former secretary and past president of the British Astronomical Association and now director of the BAAs historical section. He has written widely on the subject. Of particular interest is our report from NASA on the future of space exploration, now that the lunar exploration programme has with its blend of tragedy and spectacular success - shown the way ahead. The glossary and reference tables conclude the diary, as before. In presenting this revised form of the handbook, would add that we hope to continue to hear from readers. Many of the revisions and changes in the pages that follow have been the direct result of readers comments - and this policy is very much in our minds in planning for the years that lie ahead.